By now, the list of social-media failures has grown so long that it’s difficult to keep track, but there are some standouts — like Kenneth Cole and his Egypt tweets, or failed attempts at engagement by brands like McDonald’s and JP Morgan. Now we have another shining example of the genre, thanks to the New York Police Department, which decided to reach out to some of its fans and encourage them to share photos of themselves with members of the force. 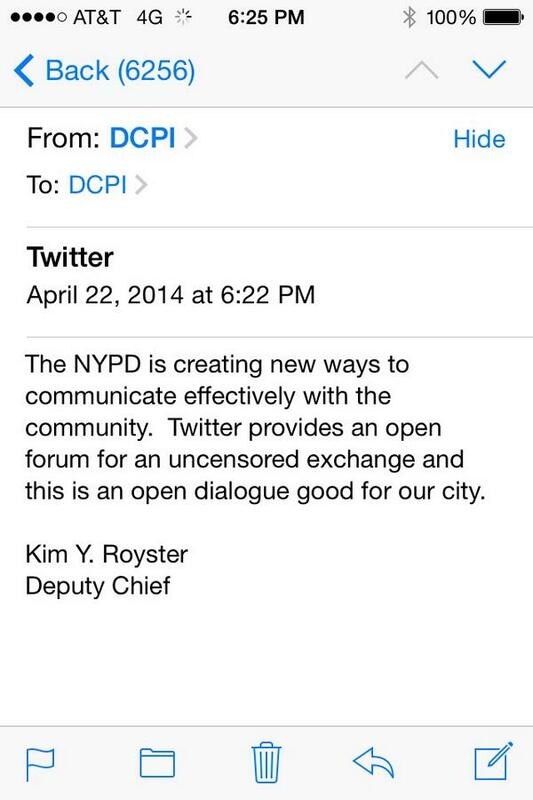 The result was a blizzard of anti-police sentiment attached to the #myNYPD hashtag. The initial photo posted by the department was friendly enough: it featured two smiling officers flanking an equally happy member of the public, with a message that asked followers to post pictures with the hashtag for use on the NYPD’s Facebook page. But what followed likely wasn’t what the force had in mind. As digital-media veteran Dan Gillmor noted, the NYPD hashtag failure was a classic example of not understanding how social media works — and in particular, the speed with which a hashtag or other social trend can be overtaken by less-favorable elements. And now the exercise has become another example of what not to do. What a bunch of entitled losers that posted those pictures. There’s a story behind every picture and it’s relatively obvious that their photo captions mislead the audience. Policemen, particularly in high crime areas, have an extremely difficult job that requires a perfect balance of tact and authority. Having too much tact can potentially cost them their lives while having too much authority receives an overbearing amount of criticism from the public. I’d love to see any of the critics take on their role for a day. “…having too much authority can cause a life to be taken unnecessarily.” Fixed! see what kinda truth can come out when you move to transparency. the transition to a ethical police force will take some time, but eventually, they will #StopPoliceBrutality and #NormalizeTolerance because that is what we will demand they do as our transparency of government gets implemented. Thanks for this. Andâ€¦ OUCH. I bet that response from Deputy Chief K.Y. Royster was tough for her to post. —- BTW– A social media tip for you, GigaOm: Get your web developers to allow you to select the Facebook Graph preview image for an article. This one deserves a much better preview than a stock image of a keyboard with a blue Twitter logo key.